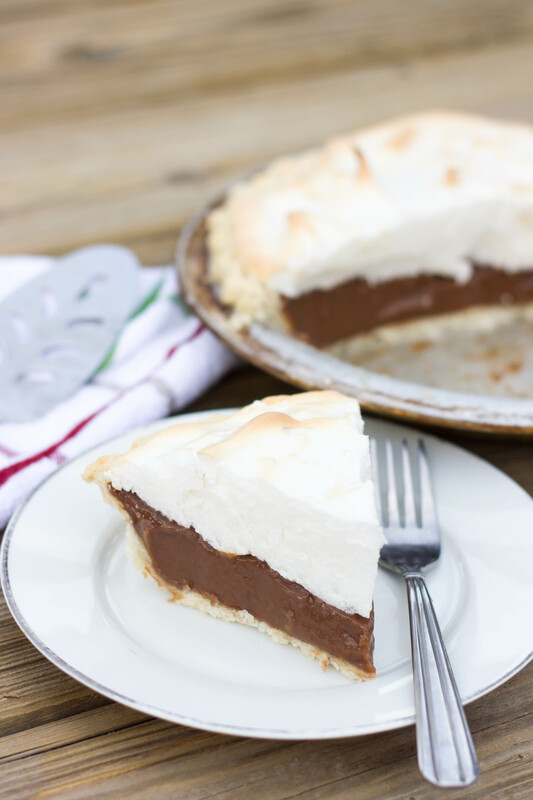 This recipe is a classic chocolate meringue pie recipe – simple but delicious. 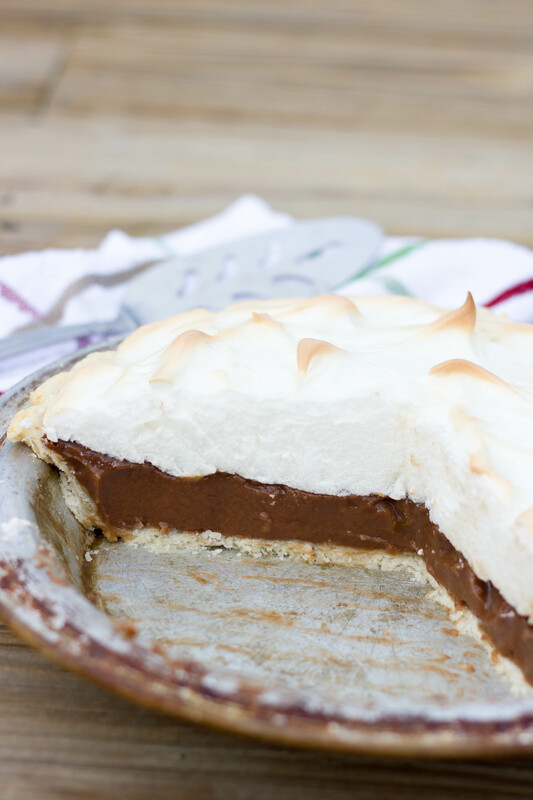 Flaky crust, with a smooth, creamy milk chocolate custard, and topped with meringue – who wouldn’t like that? While I don’t particularly like meringue, it does keep the pie from developing a film after it cools, but you could place a piece of plastic wrap directly on the warm custard if you don’t like meringue and this will prevent the film formation. 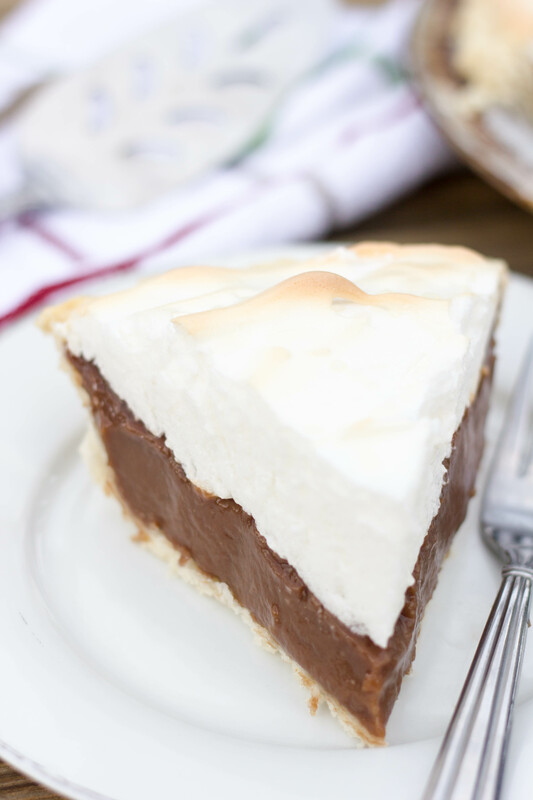 I like to eat my chocolate pie while it is still slightly warm or when it is really cold. You can leave it at room temperature for several hours, but leftovers should be stored in the fridge. You really should give this pie a chance. There’s a reason it’s a classic! Enjoy! 1. Preheat oven to 425 degrees. In large bowl combine flour and salt. Whisk to combine. Add shortening and place in the freezer for 15-20 minutes or until very cold. 2. Cut shortening into flour mixture with pastry cutter (or 2 knives) until pea-sized crumbs. Add ice water one tablespoon at a time until mixture just forms a ball. 3. Turn out onto lightly floured surface. Using a rolling pin, roll into 11-12 inch circle. Transfer dough into pie plate. Bake in preheated oven for 10-12 minutes or until golden brown. 4. While crust is baking, prepare the filling. In medium saucepan, whisk together sugar, flour, and cocoa powder until there are no lumps. Add in milk and egg yolks. Whisk constantly over medium heat until mixture thickens, ~10 minutes. Remove from heat and whisk in vanilla and butter. Pour into (hot) cooked pie crust. 5. Reduce oven temperature to 325 degrees. In bowl of stand mixer with whisk attachment, beat egg whites and cream of tartar on medium speed until foamy. 6. Gradually add sugar and increase speed to medium high. Continue to beat until mixture is glossy and forms stiff peaks. Beat in vanilla until fully combined. Spread over (hot) prepared filling, being careful to seal the edges. 7. 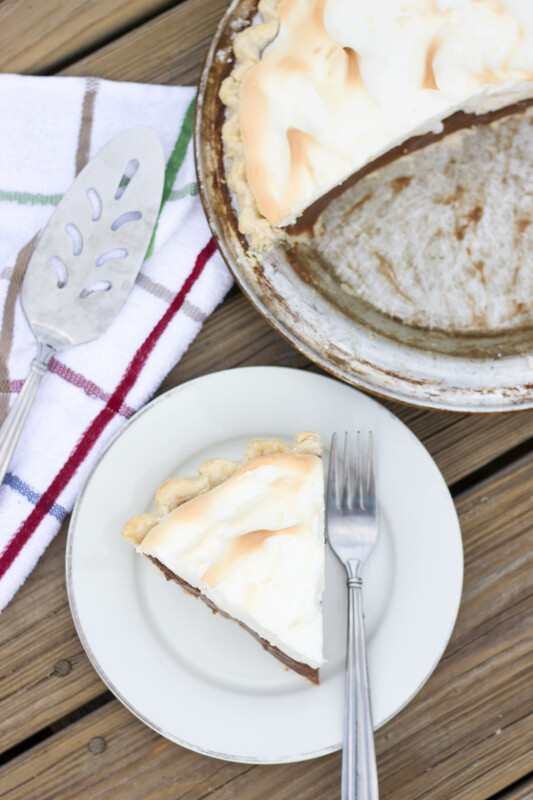 Bake at 325 degrees for 15 minutes or until meringue is golden brown. Let cool to room temperature. Can be served room temperature or cold. Store leftovers in the fridge. 2. You will need 2 whole eggs (separated) plus 1 additional egg white. 3. In order to keep the crust from getting soggy, pour the hot filling into a hot crust.